Climate change is currently a hot topic and one of the ways you can do your bit is to change your household to GreenPowerTM Electricity. However you have to be careful because there’s a big difference between how “green” different electricity plans really are and you don’t want to be trapped into a long term contract (typically 3 years) with a plan that costs more but makes little difference to climate change. Green PowerTM is defined as: “a national accreditation program that sets stringent environmental and reporting standards for renewable energy products offered by electricity suppliers to households and businesses across Australia. If you choose a government accredited GreenPowerTM product, your energy supplier agrees that the equivalent amount of energy you nominate is produced from renewable sources [such as wind, solar, biomass, hydro etc], avoiding the use of coal-derived power. Energy suppliers’ GreenPowerTM products are independently audited so you can be sure your money is being well spent. GreenPowerTM is delivered to your house or office in the same way as your existing electricity. There are no special adapters to use and no special equipment to install. All you need to do is contact your electricity supplier and ask about their GreenPowerTM options. Around 50% of household-generated greenhouse gases come from the use of electricity. Signing up to 100% GreenPowerTM means you can reduce your household emissions by around 50%. The trouble is that there are lots of different “green electricity” plans offered by the various electricity companies, but only a few are TRUE 100% accredited GreenPowerTM and the real benefit to the environment is made by electricity companies offering 100% accredited GreenPowerTM plans and investing in “new” sources of GreenPowerTM like Solar, Biomass and Wind which are added to the electricity grid not just shuffling around energy from “old” existing renewable sources of power like the Snowy Hydro project. 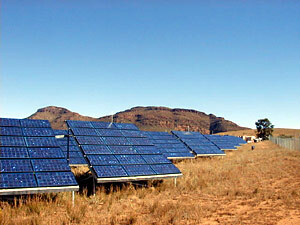 An example of a set of solar panels station in the Flinders ranges, South Australia can be seen at right. So when you decide which Green electricity plan to choose from the various providers in your state/territory make sure that they certify what percentage is real GreenPowerTM with a logo like the ones at right. What if I can’t afford 100% GreenPowerTM? If you can’t afford 100% Green PowerTM straight away, you can still make a difference by switching a percentage of your home power across to Green PowerTM – using even 10% Green PowerTM makes a difference and some electricity companies offer it at no extra cost. Every bit of power we get from renewable energy not only helps the environment through less emissions, it also helps to support the companies that are doing the right thing and encourages other companies to start moving towards renewable energy sources. Who Provides the Best GreenPowerTM Deal for Your Home? You should be able to sign up for a 10% accredited GreenPowerTM plan for either no difference in cost to your current plan or a minimal increase. As the percentage of accredited GreenPowerTM in your electricity plan rises the cost does as well so shop around and see which plan suits your budget best. To the best of my knowledge there are currently plans offering: 10%, 20%, 50% and 100% accredited GreenPowerTM across the various electricity companies. These electricity products are believed to come from renewable sources that have been part of our electricity system for a very long time or are already part of legislated schemes – buying from them will not reduce Australia’s greenhouse emissions or contribute to making more clean energy. Don’t buy these if you want your electricity to come from new clean energy! Thanks for this information, its really useful. We were with Energex in Qld, but they have been bought by Origin recently. I note from the WWF list that Origin GreenEarth rates the highest, however I am not sure this is true for Qld customers. I called Origin and they said the green option for QLd is just the previous Energex option (Earth’s Choice) rebadged – something to be aware of from Qld customers! I’ll be sure to link to this info from there too. Don’t put a lot of faith in the ‘Green Watch’ energy comparison. Origin, which comes out on top, are the leading sponsor of the people that put it together, so it’s not exactly unbiased. I’ve just googled green power and your blog came up about not getting tricked into buying fake green power. What I find interesting is that you suggest to buy only renewable energy from companies who have the accredited label of Greenpower tm. You say not to purchase from jackgreen. Why is this? I’ve just been to their site and they are accredited by Greenpower tm. Are you mistaken or are they, along with channel 10 who advertised jackgreen during there “Cool Aid” show. EDITOR: I said that because only the accredited portion of makes a difference and the plan Jackgreen promotes the most is only 10% accredited. Many GreenPower products include only a small percentage of accredited GreenPower tm. Some products are sold as “100% renewable” but it is only the accredited portion that makes a difference. Even if the remainder is renewable, it consists of renewable energy that is already in the grid or already being counted towards mandatory targets. Therefore your purchase does not contribute to the growth of new, renewable energy or assist in reducing our current greenhouse gas emissions. I am a resident of Tassie and am disappointed that there is no green power provider for this state. How come. Has the Premier been at work again! EDITOR: You’re right Jill, no one could accuse Paul Lennon of being green! Jackgreen now offers 100% accredited greenpower for only $2 extra per week. It’s 100% from wind from what they told me. Unfortunately it looks like none of the review web site like http://www.greenelectricitywatch.org.au/ updated their site to list the new products. My concern is that amount of electricity generated by green power falls short of orders even though your money will still be taken. Last year a sales person from origin tried to sell green power but when I asked how they intended to make up for the loss of electricity that was once generated from empty hydro electric dams she told me that the shortfall was automatically supplied by traditional fuels. I guess when the wind dies down or the sun sets traditional fuel will always be there even though the green power plan keeps us feeling good. It would be great if the claims of saving GHG are supported by a marked decline in the use of fossil fuels, but as it is, there has been no saving. Green power just represents another energy, another product, a placebo at best but not a solution. When they have one where your money spent is invested in Nuclear power I will really be interested. Its the only green solution that produces enough power while also producing minimal CO2. Look at France. I can ride a train there knowing that im not harming the environment. Australia’s so selfish and irresponsible in its use of power. I wouldnt be surprised if its uninhabitable by the end of the century, if not half that. Im signing up with jackgreen VIC in the meantime. Good value 100% deal. EDITOR: Good on you for choosing GreenPower but you’re joking about the Nuclear option right? “The operation of a nuclear power station itself does not directly produce greenhouse gas emissions. But this is only one stage of a complex nuclear fuel cycle that also involves mining, milling and enrichment of uranium; fabrication of the fuel rods; construction of the power station; management of nuclear wastes and dismantling of the station at the end of its operating life. All these stages use energy from fossil fuels and so emit CO2. In the case where high-grade uranium ore is used, CO2 emissions from the nuclear fuel cycle are much less than those of an equivalent gas-fired power station (see reference http://www.stormsmith.nl) But the world’s reserves of high-grade uranium are very limited and may only last a few decades. The vast majority of the world’s uranium is low-grade. CO2 emissions from mining, milling and enrichment of low-grade uranium are substantial, and so total CO2 emissions from the nuclear fuel cycle become greater than or equal to those of a gas-fired power station. Thank you so much for your information. I had heard about scams like this, but I had no idea how bad it was. Our company’s office is looking into getting solar panels because we think it is important to do our part in helping the environment. We work in downtown Denver, and although there is a great deal of progess in Colorado toward sustainability in business practices and helping the environment our city still has a long way to go. 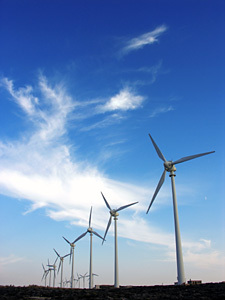 Our company is moving toward offering greener products, as well. We are trying change fact that our industry is the second most waste producing industry in the United States (the trade show industry.) Our company, Trade Show Emporium, not only offers green displays, but they recycle old, non-green displays so that they don’t end up in landfills. The two employees of this little company make sure to live green as well–they are soy-milk drinking, animal loving tree-huggers. So make sure to support small, eco-friendly businesses like this one, and help our Earth. The comments re Jackgreen ONLY having 10% accredited green power are out of date. They offer a MINIMUM of 10% in all plans, but some plans offer 100%. I have been using their 100% accredited greenpower option for a number of months now. I also run a website (Plug: SeeknBuy.com.au). I host this in the US, as their bandwidth is much cheaper HOWEVER I made sure I was hosting it with a provider powered by 100% renewable energy. Again, call this a plug but there is a small link from most pages on my site. BTW I am NOT paid by Jackgreen, and I only offer them as another link from my site as I happen to like this planet. The arguments re: the non 100% accredited plans are valid, getting 90% of your power from Snowy Hydro won’t reduce Australia’s carbon footprint is true, HOWEVER it won’t increase it either. If you choose some other providers who may source your 90% from coal, and if we then need to build another coal power station (as the NSW Govt is seriously thinking of doing!) then you may well INCREASE our emissions. Do what you can afford. 10% accredited can be bought from multiple providers for NO extra charge, so do it. BUT be aware of where the other 90% comes from. That 90% may not reduce our emissions, but make sure it won’t INCREASE them! Although green energy won’t become economically feasible for a decade or two(so they say), a real impact on carbon output is highly unlikely until it does. We are on the verge of a new presidency in the US. So far it has meant that Green Power and the standards will be applied to some big alternative energy products. This will have some good effects if done right. I think there is enough that individuals involved with solar and wind energy systems along with the GreenPower plan that the EPA displays on it’s site. More people are getting involved. If it does get to top heavy it could cause problems. This overall is unlikely. Out with the old plan. In with the better one. Thanks for your article. It is very usefull to know in which way you figthing there the climate change. But since we live in a real world scams are everywhere and people (consumers) should be very carefull about their choices. However solar energy technology have make great steps in terms of the reduced prices of solar panels and in a few years hopefully we ll have the so desired grid-parity. As so we have to be optimistic. If you are going to have a website like this at least keep it up to date and provide CORRECT information. Red Energy does provide a 100% green accredited option now. I know this because i work there. if your going to provide links to sights such as ‘go-switch’, that in itself is misleading. I know for a FACT that go-switch pay at least one retailer $90 per person it signs up. Go Switch also doesn’t provide smart meter rates, so anyone who has a smart meter checks rates through go switch automatically are quoted incorrect rates. If we want to reduce the effect of climate change and want to save the planet from dying we should think about renewable energy options. This is great post and provides a lot of information. Previous PostPrevious Democracy 4 Sale – Whos Donating to Politicians?